Nutrition is one of those topics that can very quickly generate a heated debate among people with opposing viewpoints. Once a person finds an approach to nutrition that works for him or her, naturally, that person will most likely want to share that information with someone else in the hopes of making a positive impact on their life. While this approach may work sometimes, it is usually met with some resistance at first, because people, in general, do not like being told what to do. In my experience coaching the last few years, I’ve observed that it seems many people at some point will come to their own realization about what they need to change with their nutrition. I made a pretty substantial shift in my nutrition some 5 years ago, which completely changed my life for the better. Witnessing this change made me want to share what I learned with everyone and get them to eat the same way I did. I quickly learned that this was not the best way to go about helping people change. Everyone’s different, in their genetics, lifestyle, and the way they process, absorb, and react to the foods they eat. This experience has led me to investigate the similarities instead of the differences between various nutritional philosophies. What nutritional approach may have worked for a person last year may not work for the person this year. There are way too many factors involved for personal nutrition to be an unchanging process. Factors such as exercise modality and intensity, stress, nutrient deficiencies, seasonality of foods, culture, and traditions are some of the factors that will dictate which nutrition philosophy a person will follow. It can be overwhelming at times to be exposed to so many differing nutritional philosophies that have come, gone, and stuck around over the years. In this post I’ll briefly describe three of the most ubiquitous nutritional philosophies that have been the most influential on people’s food choices in the last decade, in my opinion. Rather than going on a diatribe about which I think is “better” or “more effective”, I’ll cover what these nutritional philosophies are comprised of and what we can learn from the principles they have in common. If you’d like to optimize your nutrition to achieve the body and performance you deserve, check out The Foundry eight-week nutrition coaching program. Today we will cover three popular nutrition strategies: Vegan, Paleo, and Ketogenic. A Vegan diet is one that eliminates all animal foods such as meat (including fish), dairy, eggs, and honey. The premise behind the nutritional choices of a Vegan diet is to live a life that excludes exploitation of, and cruelty to, animals for food, clothing, or any other purpose. This diet also seeks to eliminate highly-processed foods and sugars. This diet is plant-based (i.e. lots of vegetables), and includes foods such as fruits, nuts, grains, seeds, and beans. It also includes higher fiber, starchy foods such as oats, sweet potato, wholemeal bread, whole wheat pasta, brown rice, and small amounts of fat. Sources of protein include beans, lentils, chickpeas, tofu, or peanuts. A Paleo diet is one that eliminates all processed foods, refined sugars, refined vegetable oils, dairy, grains, and legumes. The premise behind the nutritional choices of a Paleo diet is to eat foods that mimic those that our pre-agricultural, hunter-gatherer ancestors ate. Some core principles that comprise the Paleo philosophy are: eating a higher-protein diet compared to the average American diet, eating less carbohydrates, eating more fiber, eating more monounsaturated and polyunsaturated fats with optimal omega-3 to omega-6 ratio, lower sodium intake, and higher intake of vitamins, minerals, antioxidants, and plant phytochemicals. This diet includes grass-fed meats, fish, eggs, fruits, vegetables, nuts, seeds, and healthful oils. A Ketogenic diet is one that seeks to drastically reduce carbohydrate intake, maintain a moderate protein intake, and drastically increase fat intake. 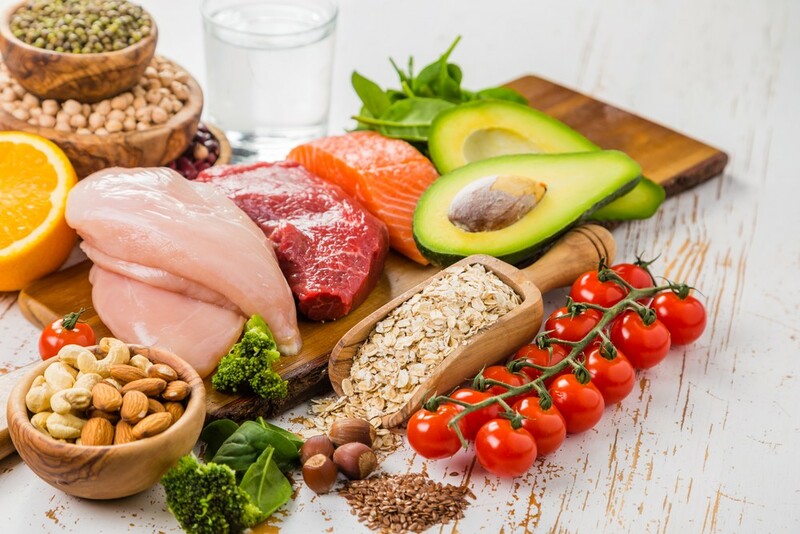 The premise behind the nutritional choices of a Ketogenic diet is to improve the body’s utilization of fat, while reducing its dependence on carbohydrates for fuel, thus improving body composition, health, and certain athletic performance. Some core principles of this approach are to keep digestible carbohydrate intake below 100g per day (ideally below 50g per day), ensuring that protein intake is kept to a moderate amount that is no more than the body and training demand, and ingesting the remainder of the body’s energy needs in the form of fats. This diet seeks to eliminate foods high in sugar and starch such as bread, pasta, rice, potatoes, and processed/refined sugars. The diet includes meat, fish, eggs, vegetables that grow above ground (non-starchy), cheese, and natural fats. As you can see, there are plenty of differences between these nutritional approaches, but this isn’t an article about those differences…I could go on forever about those. What I wanted to accomplish with this post is to make you aware of some of the various nutritional approaches out there and to explain some of the similarities that you can use to build your own personalized nutritional approach. Ultimately, there are various reasons why people would subscribe to any one particular “method” of eating, but lately, I’ve started to move away from labeling. Instead of labeling yourself as “Vegan”, “Paleo”, or “Keto”, consider the following similarities they have and create your own wholesome, unlabeled nutritional approach that works best for you. Similarity #1: People that are successful in utilizing any of these approaches eliminate or drastically reduce refined and highly-processed sugars (i.e. soda, flavored/sweetened drinks, candy, pastries, etc). These people are generally very good at something called intuitive eating, and they have a healthy relationship with food, and they know when and where they can fit these foods in if they don’t eliminate them completely. I can assure you that there have been plenty of people that have not succeeded using any of these approaches because they didn’t limit or eliminate these foods. Unfortunately, in our society we’re constantly surrounded by these foods, but they have no place in our body and they only serve to increase our risk of obesity, hypertension, and cardiovascular disease. Similarity #2: Veggies, veggies, veggies! I could go on and on about the benefits of vegetables and why our bodies require them. The key here is that all these approaches contain them, and anyone that includes more vegetables in their diet will certainly reap the health-improving benefits of them. They are rich in antioxidants, vitamins, minerals, and phytochemicals, which are all vital for the health of our cells and the proper functioning of our bodies. It may sound simple, but these two similarities amongst each of these approaches have the power to make the BIGGEST difference in our health. And quite frankly, until you nail these two fundamentals, it’s pointless to debate small differences in carb intake, intermittent fasting strategies, or what type of oil to use. With so many people focusing on these flashy details rather than the big picture, it’s no wonder most people give up on a new nutrition plan after just a few days or weeks. Whether you subscribe to a particular approach or pull bits and pieces from each one, just remember these two similarities. Give your body the vegetables it needs and eliminate or drastically reduce the other garbage. For help optimizing your nutrition, improving your performance and achieving the body you want, check out our eight-week nutrition coaching program.